Nested Petri nets (NP-nets) is an extension of the Petri nets formalism within the “nets-within-nets” approach. Due to tokens with individual behavior and the mechanism of synchronization NP-nets are convenient for modeling multi-agent and adaptive systems, flexible workflow nets, and other systems with mobile interacting components and dynamic structure. In contrast to classical Petri nets, there is still a lack of analysis methods for NP-nets. 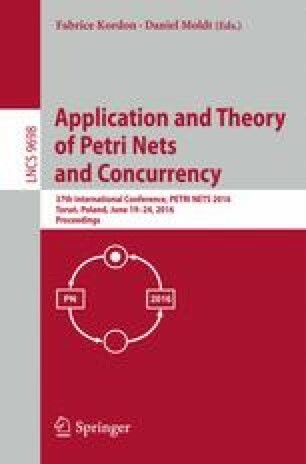 In this paper we show, that the classical Petri nets analysis technique based on place invariants can be extended to NP-nets. This paper defines place invariants of NP-nets, which link several NP-net components and allow to prove crucial behavioral properties directly from the NP-net structure. An algorithm for computing NP-net invariants is presented and illustrated with an example of EJB system verification. This work is supported by the Basic Research Program of the National Research University Higher School of Economics and Russian Foundation for Basic Research, project No. 16-37-00482 mol_a.